Democratic candidate Elizabeth Graser-Lindsey and Republican candidate Christine Drazan talk issues like education, cougar hunting and Cap and Trade. 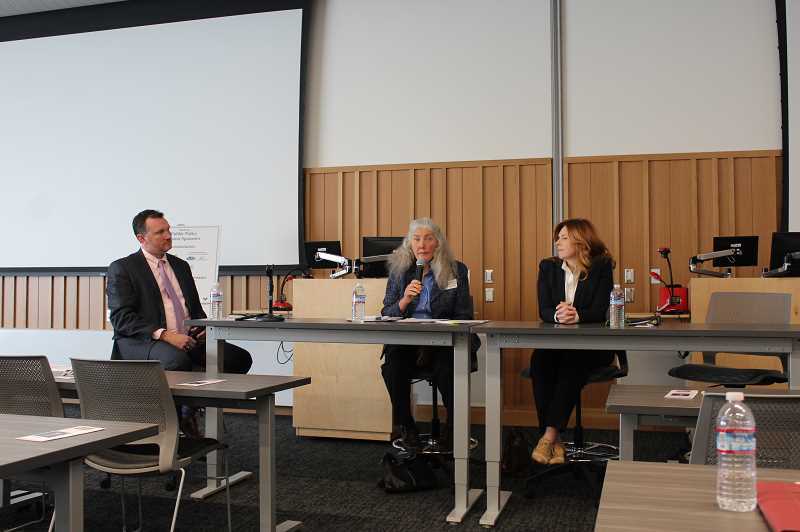 After the debate between candidates for U.S. House of Representatives (District 5), on Monday, Oct. 15 at Clackamas Community College's Harmony campus, the ladies took over. The two candidates for Oregon House District 39, Elizabeth Graser-Lindsey (D) of Beavercreek and Christine Drazan (R) of Canby spoke on topics of education, cougar hunting, Cap and Trade and more. Graser-Lindsey lives on a small farm in Beavercreek, where she led efforts many years ago to prevent Metro from urbanizing the area. She holds a PhD in Bio-Environmental Engineering and has experience as an agricultural scientist, professor and mother. As she seeks office, her primary focuses include preserving rural areas, addressing the shortage of local, family-wage jobs and taking care of the environment. Drazan too lives in a rural area outside of Canby. She served as Chief of Staff to the Speaker of the House during the eight years that Governor Kitzhaber was in office the first time, which she said, gave her specific experience she needs to fulfill the new role she seeks. Her focuses are improving graduation rates and reforming the state's spending and budgeting process. Despite their party affiliations, the candidates agreed on several topics. They agreed that the idea of tolling I-205 is both unpopular and unbeneficial to people in District 39, which covers areas such as Barlow, Beavercreek, Boring, Canby, Charbonneau, portions of Damascus and Happy Valley, Estacada, Mulino, rural Oregon City and more. They also agreed on several education topics, like that the rising costs of PERS is affecting the level of services that schools are able to offer and therefore a solution is necessary. They agreed schools should foster interest in the trades and should be funded appropriately to do so. But when it came to a specific question about the Quality Education Model, the candidates took different approaches. Graser-Lindsey spoke generally about quality education, primarily suggesting schools ought to be engaging and relationship-driven and that teachers should be allowed the freedom to bring their talents to the classrooms. Drazan answered more specifically as she had experience with the model during her time with the Speaker of the House. "Unfortunately, the Quality Education Model has never fulfilled its promise," Drazan said. "What it's never driven is a response and a relationship, a kind of back and forth collaboration with schools, where they also are accountable to everything that's listed in that model," she said, "to begin to, when we provide that level of funding, then provide that level of education. It's just never worked that way. And because it's never worked that way, I really believe it is something that's ripe for review and reconsideration." In light of the recent fatal cougar attack, the candidates were asked their opinion on allowing licensed hunters to hunt cougars using dogs under certain conditions. The candidates disagreed. Graser-Lindsey concluded that hunting cougars is not necessary. "In Beavercreek, where I've talked to lots of people, but I assume the same throughout the district, there are a lot of cougars," Graser-Lindsey said. "People comment on them being in their experience throughout their year. People who have livestock keep this in mind. "I don't think that the problem of the individual who was killed that that can be solved by hunting our way out of it," Graser-Lindsey continued, "because cougars are a part of our community. So those of us that have livestock, we have to deal with it…We also have the issue of coyotes, so people have to figure out how to keep their livestock safe." On the other hand, Drazan suggested that the cougar population has become an issue of public safety, and something should be done to control it. The candidates also expressed their views on Cap and Trade, a potential program aimed at reducing emissions in Oregon. The candidates went back and forth twice on this issue to get their points across. Drazan said that while she agrees climate change is a problem, she sees it as a national and global problem. She said that Cap and Trade is actually less about climate change and more about the $1.4 billion in revenue it would generate that would not be dedicated or protected. "They're not like our gas tax that would go to a particular thing like the roads," Drazan said. "It really would be a new revenue source that could be used in a variety of ways. And so, for a lot of reasons…I don't think Cap and Trade is a good idea for Oregon." Graser-Lindsey acknowledged that she prefers the simpler idea of a carbon tax over Cap and Trade, but insisted that some sort of incentive is necessary. "At this point, the [UN Intergovernmental Panel on Climate Change], they have said that we have run out of time," Graser-Lindsey said, "and that if we want our future lives and our children's lives to be anything like what we're familiar with, we need to immediately act now. We don't have time to wait anymore." She concluded, "I think we can't keep arguing about what we're going to do, or just say we're doing nothing because we've already waited way too long." The candidates had their say, but they'll really face off Nov. 6 when voters have their say.